Have you ever come up short on a rappel when you remember that you’d managed to make it before? How about tried to toprope a pitch only to find yourself unable to lower a climber to the ground when others, with the same length ropes, had no problem? This might not simply be your memory going bad on you. There are significant differences in the lengths of ropes all labelled and sold as being identical. And these difference don’t just occur among various brands, but actually are apparent within brands and even matched pairs of twin and half ropes sold as sets. I originally became aware of these major differences when trying to evaluate ropes based upon their weight, measured in grams per meter. 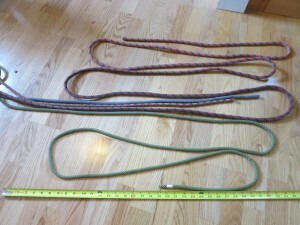 I quickly realized that I couldn’t simply divide the rope’s weight (easy to measure) by its stated length, because none of the 8 different 60m ropes I tested was actually the same length as any other. 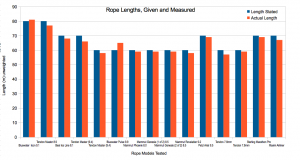 The skinniest (and lightest, per-meter) rope wouldn’t necessarily weigh the least, since the manufacturer may have cut it longer. In short, I couldn’t evaluate the grams-per-meter because I couldn’t reliably know the number of meters. 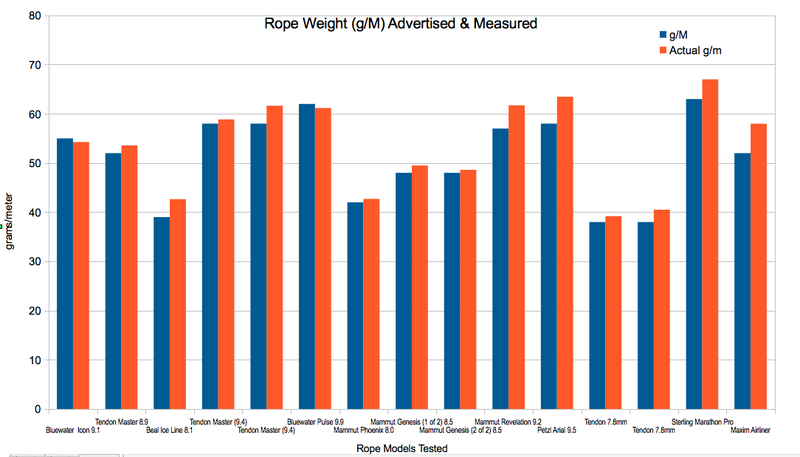 This inability to accurately weigh a rope proved especially frustrating, because evaluating a rope based on the advertised diameter is the only real alternative, but this relies on trusting the self-policed measurement of a company whose interests lie in selling you their new ultra skinny rope. And these measurements are made with calipers which can easily pinch down a few millimeters onto the rope, yielding an inaccurate measure. Furthermore, some ropes have an immediate tendency to expand and puff out when used, making their initial diameter especially irrelevant. The weight, measured in grams/meter, was clearly the best option. I just had to know how many meters my 60m ropes were. I drug a pile of more than 10 different ropes to a nearby high school tennis court, and was able to use the painted lines to measure out approximate distances for all my cords. Note that none of these measurements were made when the ropes were being weighted or sen hung vertically, so they would certainly allow for rappels longer than 1/2 of the lengths listed below. But in the end I was amazed at the differences among these ropes, both in terms of their lengths and their weights. All of these ropes are also used, and some have been used for years. The measured weight may include some dirt and another alpine debris gathered over the course of a few seasons of use, but even this is useful to measure, because if particular models are more prone to collecting dirt and gaining weight, that information is worth knowing. It’s easy to see why some local pitches (Thin Fingers for 70m ropes immediately comes to mind) seem to be the site of frequent accents or near-misses, when climbers swear their rope will be long enough to set up a TR, because they correctly remember being able to do so in the past. Some “70m” ropes work, and others don’t. 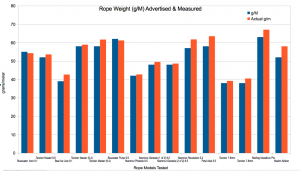 The takeaway for rope evaluating and rope-buying users is to try and weigh the ropes yourself, before buying, and without simply relying on the published weight. Ask to un-spool and compare the lengths of ropes you are considering buying, so you can know if that additional weight is due to a heavier rope, or merely a longer one. And learn which of your pair of twin or half ropes is actually longer, and thread that rope through the anchor on any rope stretching rappels. Using all the rope you’ve got with you is the next best thing to having a 62-meter “60m” when you remember your rappel just barely touches down. Great article, Blake. I’ve been in the same situation you describe where one rope will just make a rappel and another won’t – even though they are the ‘same length.’ I’ve wondered about this so its nice to see you doing some real measurements. I’ve been told that some manufacturers intentionally cut their ropes slightly longer than they advertise because the ropes will shrink with use. Not sure if that’s true or not, but that would also be interesting to look into. 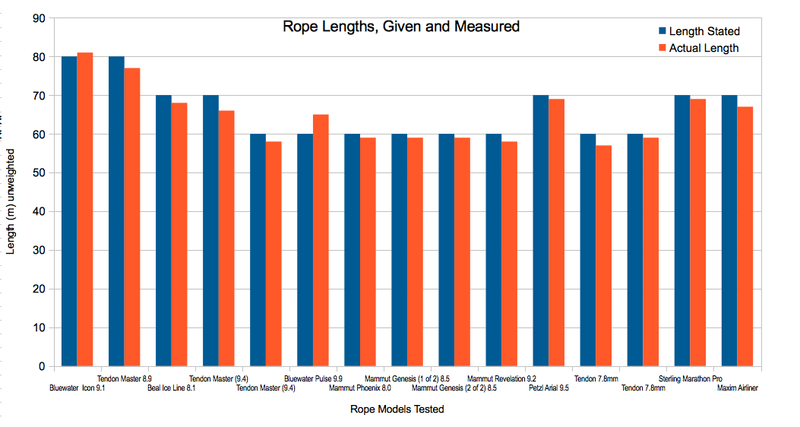 Its also interesting that the Bluewater ropes were the only ropes that were longer and lighter than advertised. Would be intriguing to expand this to more brand new and used ropes. Hey blake. Thanks for digging into this. It’s worth pointing out that the icon and the pulse are the standouts from your data, being longer and lighter than stated (all of the others, eyeballing it, go the other way). Given that the ropes are dynamic, this makes sense, and it seem like the only way to really do this test would be to stretch the ropes under bodyweight and then measure them to compare. It seems like the discrepancies that you’re measuring are likely due to the dynamic component. It stands to reason that if a rope recoils more, it will appear shorter, and also heavier/meter than advertised, while it may not be so when it’s part of a long spool. They’re all within about 5% of the advertised length (except the bluewater, which was generously long). I don’t think that’s too unreasonable; thermal expansion of nylon will account for ~1% differences in length as measured on a hot or cold day (we don’t know what temperature the factory was at, nor the temperature where these measurements were made). Climbing rope is elastic, and it gets this elasticity by the weave pattern of the fibers. There are probably many other factors that affect the length of a rope over time, as the weave deforms. It would be a more meaningful test if the ropes were all brand-new. Moreover, you do not state any uncertainty in your measurements; it’s quite possible that the error in your “tennis court” method is enough to cover the remaining few percent. Many years ago I learned the lesson. 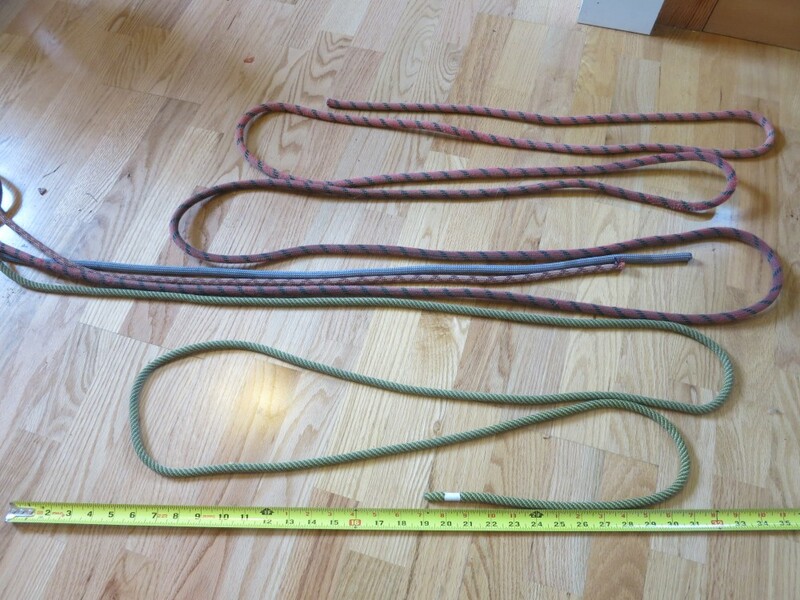 Whenever I buy a new rope, I then measure it. If it’s short, I make them take it back. If it’s long (In my personal experience most rope are 1 – 2 meters long.) I either cut it or leave it according to my needs. Thanks Blake for your work on this!